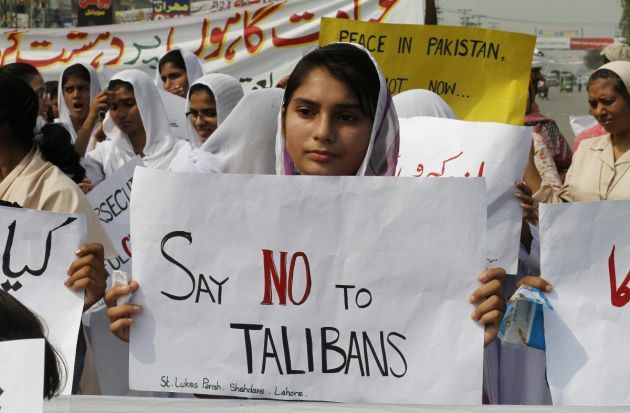 (Photo: REUTERS / Mohsin Raza)Members of the Pakistani Christian community hold placards during a protest rally in Lahore to condemn Sunday's suicide attack on a church in Peshawar, September 24, 2013. A pair of suicide bombers blew themselves up outside the 130-year-old Anglican church in Pakistan after Sunday mass, killing at least 78 people in the deadliest attack on Christians in the predominantly Muslim country. Two suicide bombers killed nine people and wounded more than 50 in a Sunday attack on a church in the Pakistan city of Quetta just over a week before Christians celebrate the birth of Jesus worldwide. Two women were among the dead at Quetta's Bethel Memorial Methodist Church in the southwestern in Balochistan province, said provincial Home Secretary Akbar Harifal, Agence France-Presse reported. World Council of Churches general secretary Rev. Olav Fykse Tveit condemned the attack. "We condemn this tragic disregard for human life at a time when people were gathered to worship as a community. We will not allow this devastating act weaken our faith, our unity, and our common work for peace and justice in the world," he said in a statement. Several of the wounded were in serious condition, police said in the Dec. 17 attack which Islamic State claimed it had carried out, Reuters reported citing a statement on Amaq news agency. Officials said police intercepted and shot one bomber outside but the second attacker managed to reach the church's main door, where he blew himself up. Christians make up an estimated 1.6 percemt of Pakistan's 200 million people and have long faced discrimination - sidelined into lowly paid jobs and sometimes face false accusations under the country's draconian blasphemy charges. One of the attackers was reported to have then detonated his suicide vest at the church's main door after receiving bullet injuries. Another was shot dead near the church's entrance by security forces, the police chief said, the Pakistan newspaper Dawn reported. The director general of civil defense said late in the afternoon that the two attackers were believed to have been aged between 16 and 20 years of age. He said the attackers had strapped 15 kilograms (33 pounds) of explosives to their bodies. One successfully detonated his explosive vest, while the other was defused. The Bethel Memorial Church has been the target of a terrorist attack in the past.